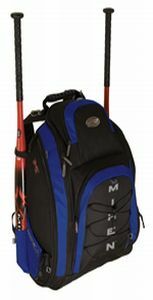 Miken MVP Backpack.Royal Blue and Black. Great Travel Team Bag. 2 year warranty. Shipping $15.00. Team discounts available. Oversized Main Compartment. Dual bat compartments. Two vented side pockets with shoe slings and additional mesh pocket for storage. Overall size: 14" W x 21.5" H x 13.5" D. Two Year Warranty. You will be surprised how much other stuff will fit in this bag other than Gloves, Balls, Batting Helmet, Wind shell, sweat shirt, cleats and bats. Parents will also find about 5 to 8 water bottles every few weeks with room to spare!